$2.00 a Day was quite the eye-opener for me. The book is based on 20 years of research, this book outlines the effects of Welfare Reform (1996) on the poor. The AFCD (Aid to Families with Dependent Children) program ended which put an end to cash subsidies to families with dependent children. A return to work requirement was implemented for able-bodied individuals, and in lieu of cash subsidies, poor families, if eligible, began to receive SNAP (Supplemental Nutrition Assistance Program), medicaid benefits, housing subsidies and childcare subsidies. The goal was to get poor people back to work. Unfortunately, those entering the workforce often ended up in minimum wage jobs with variable schedules. This made finding childcare difficult, setting the newly employed single parents up for failure when they often found themselves without childcare. Financially, even with EITC (Earned Income Tax Credit) making ends meet proved difficult if not impossible for many. The book profiles (8) different American families from different parts of the country who live in poverty, sometimes existing on as little cash as $2.00 a day, per family member. Some supplemented their cash flow by selling plasma, collecting bottles and cans and resorting to food pantries on a regular basis. The loss of job at some point was the number one reason for this level of poverty. 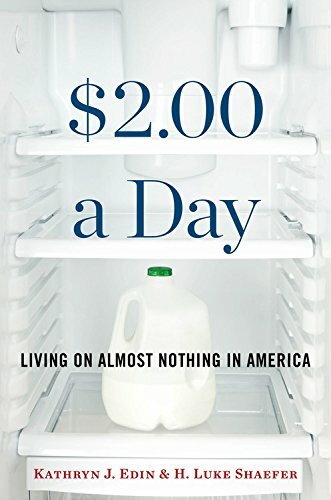 I enjoyed this book and I liked the way the book explored the "whys" of poverty and demonstrated how the working poor still struggle to make ends meet even when they played by the new rules. This would be a great discussion book for college classrooms and book groups. This reminds me a little of Nickel and Dimed, which my book club discussed years ago. I'm adding it to my list! I do remember reading that one, but this one is really different from my recollection. I bought Nickel and Dimed years ago but haven't read it yet. I immediately thought of it when I saw your title. I like to read books like this. I think you'd like it Kathy - it is different from Nickled and Dimed. 2$ per day per person sounds good in my part of the world. All relative as per wants and needs. You are right about that Mystica. Wow! I can't imagine living on 2$ a day per person! I think I need to read this. It's a pretty quick read, because I found it hard to put down. Dang, I eat $2 worth of food all by myself every day. Yes, our cats eat more than $2.00/day/each. I'm going to look for this one. I too, thought of it as the current day Nickel and Dimed when reading, but after reading your comments can see where the differences would be, Thanks for bringing this one to my attention.